Jerry Proc, VE3FAB, a resident of Etobicoke Ontario, has been a licensed amateur radio operator since 1964 and also holds an Advanced Amateur Radio Operator's Certificate. His interest in electronics was sparked at a very young age and during the 1960's Jerry developed a fascination with military radio gear. In 1970, he graduated with a diploma in Electronics Engineering Technology from the Radio College of Canada. Later, he obtained an Advanced Networking Certificate through Continuing Education Studies program at Humber College, Etobicoke Ontario. Jerry has served in both a technical and managerial capacity in the mainframe computer and data communications field since 1970 and is now retired from Bell Canada where he held the position of network support specialist. 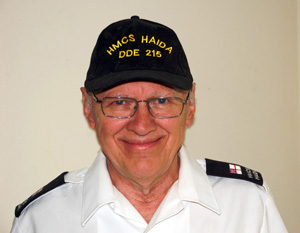 Jerry's involvement with the restoration of the radio systems aboard HMCS HAIDA (WW2 era Tribal class destroyer) started out quite innocently in July of 1992 and has now developed into a very engrossing and stimulating endeavour. During the restoration, he came across the KL-7 (off-line) and KWR-37 (on line) crypto devices on the ship's drawings but information was nonexistent at that time. By 1995, he had collected a sufficient amount of data on those two machines but was lacking photos and examples of the hardware. Eventually some photos were procured through the Communications Security Establishment and NSA but examples of the macines were never located. His interest in crypto laid dormant for the next several years until he paid visits to The Maritime Command Museum, Halifax (1998), the Communications and Electronics Museum in Kingston (1999) and the National Cryptologic Museum at Ft Mead Maryland (1999 and 2001). After having taken a number of photos at each location, he suddenly realized he had a critical mass of material on hand so that naturally led to the development of the Crypto Machines web page. Jerry has not collected any machines so far, rather opting to collect and preserve the history or information about the machines both old and new.